Whether you're a freelancer, a student or just one small part of a big company. Time Tracking can be an essential tool, to let you know, where you spent your time, how to plan future projects and what to bill your clients. However most of the time it is also an annoyance. Tick Track is designed to be your fast and reliable companion while you are working on your projects. Interactions are fast and easy, so that you can focus on what's important: Getting your work done. With a single touch, you can start and stop time tracking for projects. And switching between two projects is just as simple. So don't waste time and continue with your work. One of the single largest hassles of time tracking is forgetting to start or stop timers. Editing your timesheets in Tick Track is fast and easy, so even if you forget your timers, Tick Track has you covered. Using the latest iOS Technology, Tick Track gives you a today widget, so that starting and stopping your current projects is even easier. Pull down your Notification Center, track your time and be done with it. 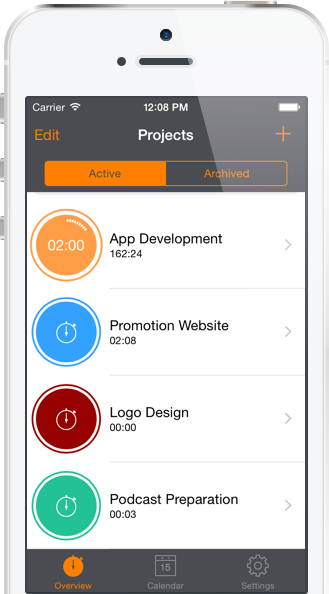 Tick Track gives you a quick overview of how long you've been working on your projects. And at the end of the month, you can export your data, so that you are always on top of your projects. Even if you are finished with a project, you still want to be able to see how long it took you to code that website or prepare that podcast. Tick Track projects can always be archived, so you can always look at your past projects. After a few weeks and months, you're project list might be very long. Tick Track let's you search through your projects easily so you never need to worry about finding a needle in a haystack. You want to get an overview of your workdays? The Calendar View makes it easy to browse past days and see exactly what you did on each day. Get quick summaries for each week, month and year that you used Tick Track. Find out if you were a busy bee or if you need to increase your productivity. Tick Track's Graphs give you an quick and easy overview of how you divided your worktime. See immediately which projects did occupy you the most. Unlock these powerful features with a one-time In-App Purchase of just 2.99$.